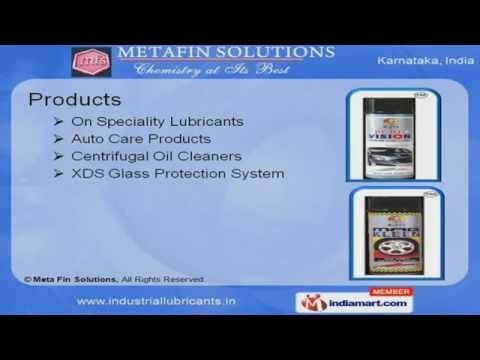 Welcome to Fin Solutions (Chemistry at its best)Exporter & Supplier of Automotive Care ProductsThe company was incorporated in 2007 at Bengaluru, with the Brand name âRelease-Onâ. Wecater to Automobile Industry across Europe, America & Asia. Superior grade raw materials, free sampling policy, sophisticated warehousing & packagingfacility make us the first choice of our clients. Our product list includes Auto Care Products, Centrifugal Oil Cleaners, XDS Glass ProtectionSystems. We offer comprehensive range of Release on 15 Z Heavy Duty, 20 St Paste, 88 H High & Releaseon Wr 214 Grease. Our firm is involved in supplying a wide range of Belt Dressing Sprays, Shine On Liquid WaxPolishes, Chokes Or Carbon Cleaners. We also offer qualitative range of Release on Engine Oil Additive, Tef Coat Premium, Rub compRubbing Compound & Adhesive Lubricant Spray. Along with that we offer Centrifugal Oil Cleaners which are highly demanded in the market. We also offer a wide range of XDS Glass Protection Systems.